Click the special Tour/Video link above. Although she has been constructed with the option to go into survey (and what a perfect boat for day sail cruises with all of the deck space and charm - brilliant for Sydney Harbour), it is equally been designed for extensive cruising and private use. 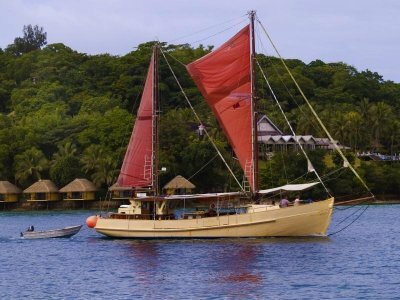 Katherine Scarlette will cruise at 7.5 knots all day into sea and up to 8.5/9 knots if required. 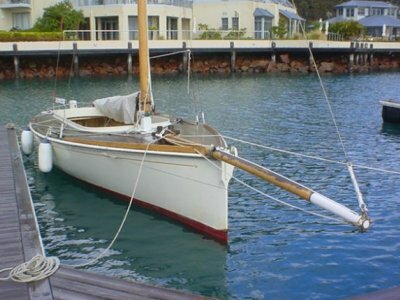 As far as sailing goes, the Gaff rig is easy to handle in any conditions and while there is the provisions for top rigs above the main and mizzen, she sails and points well, with its 6.7/7' draft and full length keel. This is the perfect deep sea cruiser and can be handled comfortably by 2 people. She will take you where you dream of going, and you will feel secure in the journey. The 120hp Perkins Diesel, coupled with a Paragon 3:1 transmission drives a 28" 3 blade propeller This combination has low hours as it replaced a smaller engine. Also there is a Petter Diesel, running a 240V alternator. The 3 cabin layout provides for a 4 berth Folksall cabin, forward, a Galley, Settee, Bathroom cabin amidships with the capacity for 2 berths and the Masters cabin and Queen style berth aft, with the cockpit astern. There is a world following of the George Buehler designed boats with the relaibility and seaworthyness almost legendary, and this one has been built for extended sea travel, but is just as comfortable (and beautiful) for cruising the coast around Australia. 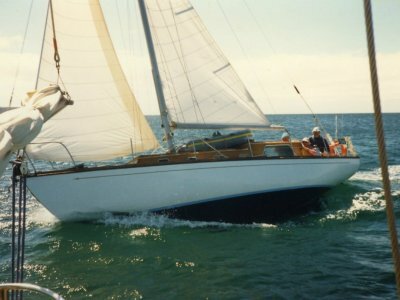 Katherine Scarlette is built to the world famous George Buehler design, and was built by an English boat builders son in Leithbridge, near Geelong, and launched as a completed hull in 1997-8. In the process of building the George Buehler designed Gaff Ketch, every effort was made to resource the strongest timbers for the job. 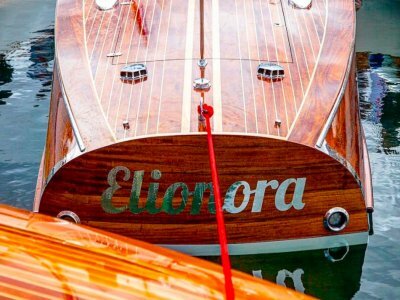 The hull framing and keel are massively constructed of Iron Bark, the 2.5" planking below the waterline is Douglas Fir and above the waterline, 2-2.5" of double planking in European Mahogany. The double and triple thickness Marine Ply decking is surrounded by 30cm bulwarks providing great protection from the elements and a safety and seating rail at the same time. The huge decks and raised cabin tops also have the benefit of providing protected sun baking and seating areas for up to 15-20 people. 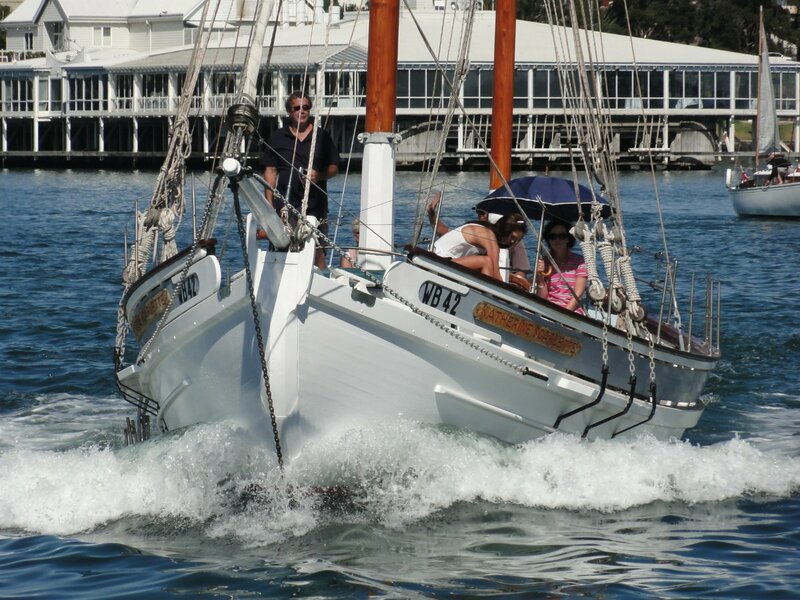 Recently the tiller steering has been altered to run with a Hydraulic feedback system, featuring a spoke ships wheel and any person can comfortably steer the boat.